It looks like news travels fast. Yesterday, I had been asked to meet with Andrew (he is the President) with We R Memory Keepers. It's always great to meet when we both have such busy schedules. I did not know I was going to meet with the President of American Crafts, but this is because the deal was not public knowledge yet. I did not know anything about the family owned business being purchased. They informed me that American Crafts had purchased WRMK and it was going public that day. They wanted me to find out before it went public. I was not at all expecting this, so I probably was saying WOW a little too much. WRMK is a large family based company with amazing tools and albums. How many of you have bought and use the Cinch because of my workshops? I even have one in my kitchen drawer. I have been fortunate to design beautiful speciality albums and card sets with them. I was so proud of the designs and sizes that I designed and they reproduced for me. Their expertise and magic mixed with the design have been selling out nonstop. I myself have had a had time getting them due to their popularity. triangles, woodgrain, dots and cabana stripes and gold heart. The cards are the same in my sets. 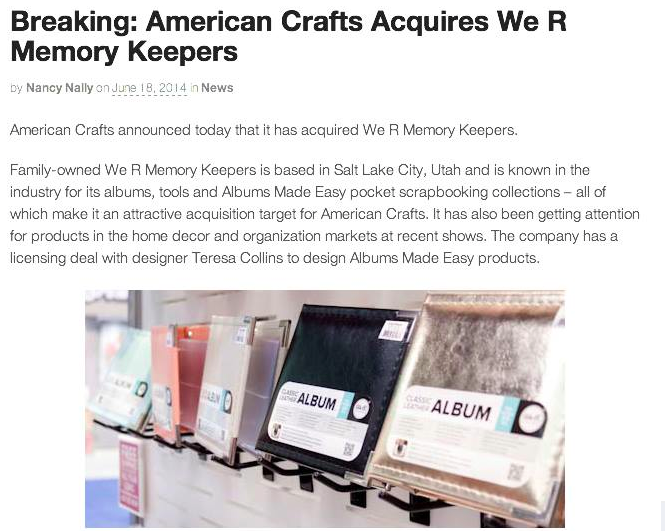 Today as many of you found out, I too found out that We R Memory Keepers has been purchased by American Crafts. Like many of you, I did not know about this huge development. At this current time, I wanted to acknowledge the many concerns, emails, texts and phone calls that have happened with this announcement. It is my understanding that Studio Gold and all of my previous albums and card sets with Albums Made Easy will still be available directly from WRMK. Many are sold out again, but efforts are being made to make sure that they will be back in stock soon. I am truly thankful for the success and excitement that my products have brought to the memory/photo keeping market. I met today with Andrew and the President of American Craft. At this time, I am not commenting on the relationship going forward. Please know that I appreciate your support and only want to express how much I have loved working with Andrew and the WRMK staff. They do offer the best quality albums and card sets in the industry. I can't wait for you to see the TC STUDIO GOLD collection of albums and cards. 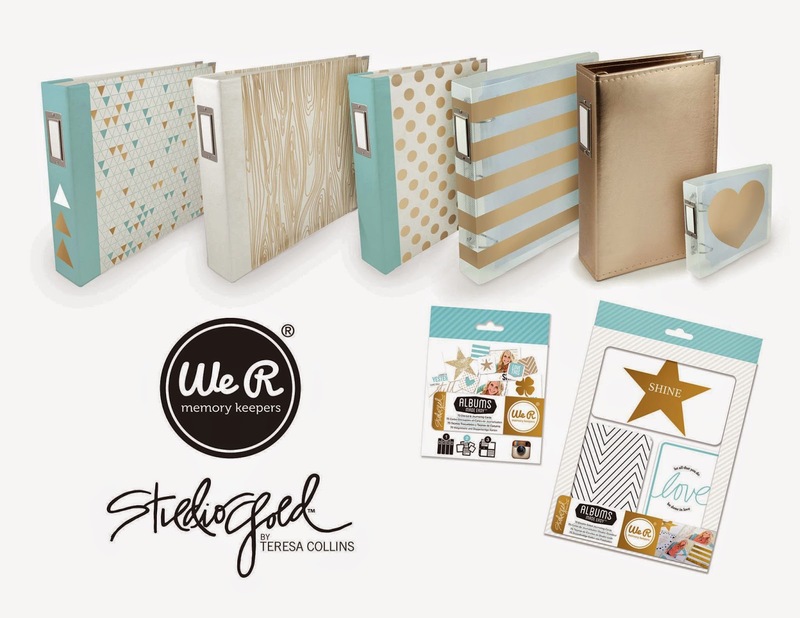 I will be teaching with my TC HELLO LIFE and QUOTED albums next week at She Scrapbooks in Florida. They will have my new STUDIO GOLD line of albums in stock. my line of albums and card sets with WRMK. I want to let you know that as a company Teresa Collins is still my own company. I am the owner and only designer of STUDIO GOLD with Teresa Collins. I designed these albums at my home, in my laundry room with gold leaf paint as a visual mock up. ha! I respect Andrew Hiller and his need to make the best decision going forward for his company. I am still processing the entire new relationship with American Craft and seeing how this new purchase does inevitably effect me and my brand of designer series of speciality albums and card sets. I will not go into detail private conversations and things that simply should not be shared. Please know as a business owner and passionate designer, I always strive to make smart business decisions. I will make sure my exclusive lines and ideas are kept and maintained, and branded as Teresa Collins. I have read over 300 emails since the news broke. I love how protective you are of me and what I create. I am reading your concerns. Please know that I cannot address each of you at this time. I will keep you all updated but MOST of all THANK YOU for caring. THANK YOU for wanting to make sure my ideas and inspiration are supported and acknowledged. 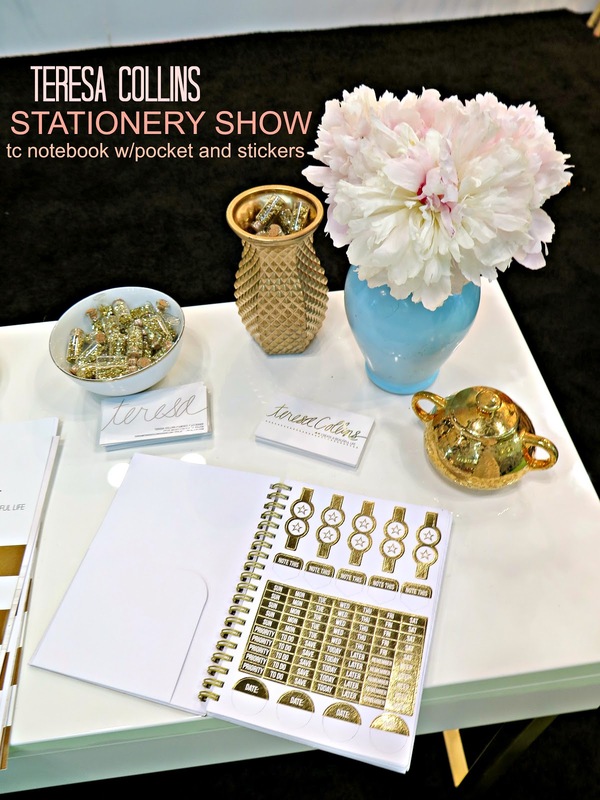 I announced before the STATIONERY SHOW you were going to see TC albums and card sets that had NEVER been done before. I am so proud of this. THANK YOU for seeing this and supporting me. I truly am thankful. NOW... 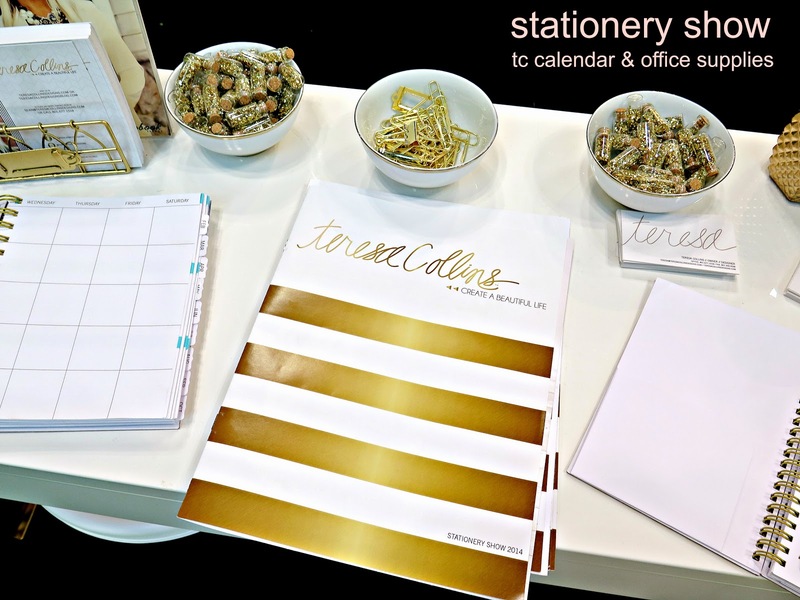 I thought I would start sharing more of my STATIONERY SHOW TERESA COLLINS DEBUT. I can't wait for the products to be available. I had NO IDEA how much to produce until after the show and needed to get numbers. I am happy to say my lines are being manufactured and I will know and post a ship date as soon as I can. This is my brochure, CALENDAR and NOTEBOOK. *you can see my gold foil business card too. to protect during the show. lots of notebook lined pages after this sticker page. I was obsessed with the FRESH flowers in my DIY GOODWILL spray painted glass vase. I have so pretty AMAZING things on the agenda. I am thankful for a business that is growing and thriving in a hard economy. You and everything you create is amazing! You have a lot on your plate right now and this development is just a bump in the road. You have a flair that is unique to you and a very loyal following! Best wishes for this wonderful journey. You will do great and I hope that AC will treat you right. Hugs and kisses! I love your creativity and your new line. You are an amazing artist. I LOVE LOVE LOVE the Studio Gold line and I can't wait for them to be available too. Teresa, I continue to pray for you and your family. 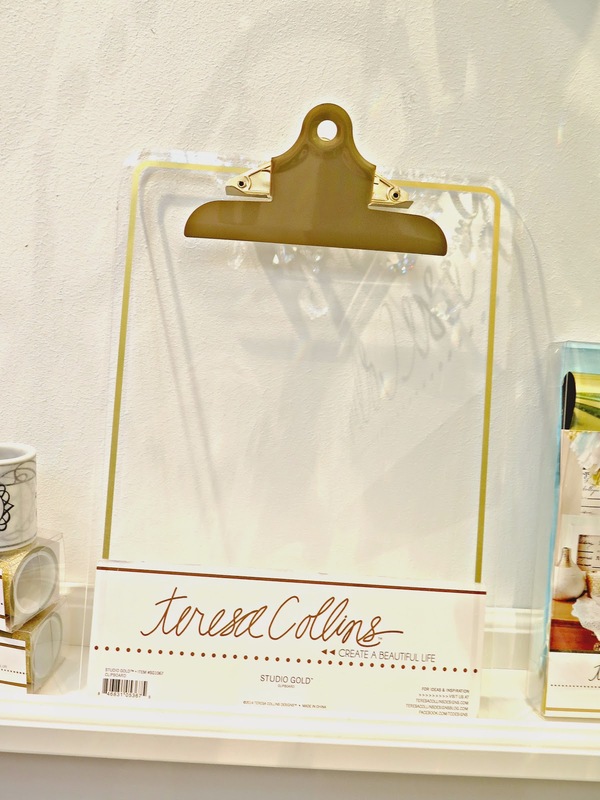 No matter what happens with these companies, our only wish is to keep having lots of Teresa Collins supplies available! Love your products. Do what is best for you, your family and your company. We will follow. I love all of your products and I am so excited for your new line, all of the gold!! WOW!! And as I said on facebook, I think American Crafts, and WeR are 2 great companies and they will move your products even to a higher level!! Keep the faith and what a great ride!! Hoping that AC treats you right and continues to support you and your ideas and projects. Teresa....I would buy your products...no matter who I had to buy them from. I am sooo excited about Studio Gold and I think the designs are exquisite! Growing up, I always had special note paper and envelopes in my desk....I can't wait to purchase these beautiful items and I am even more excited to use them! Thanks for sharing this news with us. Keeping my fingers that if your albums etc. will be produced by AC that they will be the great quality that the We R people were famous for. I don't know what will happen with WeR and AC, but I know you and your beautiful projects will continue to be successful!! If AC is going to have you products AND WRMK quality albums, I am super happy about it. I am an 8.5x11 album lover (I use this size for my traditional scrapbooking) and 12x12 for PL, and the 4x4 is super cute for gifts to grandparents!!! Not to mention as a mini album. Lets get some 6x8 in gold and vanilla too in your style and I will be overwhelmed and super happy!!!! I was introduced to scrapbooking 15 years ago when I was pregnant with my son. I was so intrigued and thought what a great way to preserve memories and make them beautiful for future generations. Also my co-workers had invited me to a home party for scrapbooking with Creative Memories (which they purchased me a starter kit as a shower gift, so thoughtful). Then I was hooked and I am still preserving memories today. Wishing you the best no matter what your journey holds. God has a grand master plan for us all and so I know he has an amazing one for you! I will always love the products you make and design no matter what company makes them because I trust you will chose only the best company to make your products, so whether American Crafts ends up making them or you chose to do something completely separate, I look forward to the adventure and exploration of God's path for your company. Best wishes & God bless to you and your family! Teresa..I echo many of the previous comments. Your products will sell no matter who manufactures them. I wish you only the best in your business life and to you and your beautiful family. I am a long time fan and I love your products. Your wonderful attitude and strong faith in God and the plan he has for each one of us has made me feel like I know you personally. I know from personal experience that he is with us at all times and holds us a little tighter in our times of trial. Your products are amazing and such great quality. I pray that you will have a great relationship and experience with AC and that they will be as honest and fair to you as you are to others. I truly hope to be able to meet you some day. You are such an inspiration to me. I hope to preserve some memories for my family that they may cherish for years to come, in a big part because of you. We all have a story and not always a happy story but a positive attitude will help get you through. You, Ty and your family are in my heart and prayers. The albums are beautiful! What size are the rings inside? I am hoping they are a 2" or 3" so they can be used for Project Life as well as a December Daily album. The 1" rings just don't hold enough. Your albums are so beautiful, just a reflection of your heart. With your energy and creativity, I know the future will be great for you ( and your followers)!